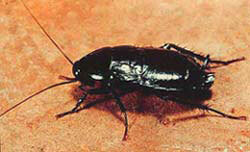 Real solutions to pest problems across the South East. 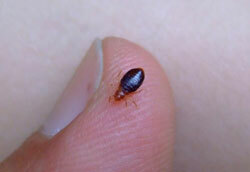 Bed Bug adults are reddish-brown, oval, flattened insects from 4 to 5 mm long and 1.5 to 3mm wide before feeding. Engorged adults tend to be swollen and dull red. The eggs are white, oval, about 1mm long and covered in a sticky film which allows them to adhere to surfaces. A newly hatched nymph is almost colourless whereas engorged nymphs are reddish and swolen. Biology: Although humans are the preferred host, bed bugs feed on many warm blooded animals. Bed bugs usually hide in cracks or matresses during the day and emerge at night to feed. They inject saliva as the feed and allergic reaction to this substance often causes slightly delayed swelling, itching and burning. Under favourable conditions each female layes 200 to 500 eggs and at temperatures above 21oC these hatch in 6 to 17 days. Adults often survive up to 2 months without food, but under certain circumstances can live a year or more without feeding. Control: The first step to deal with bed bugs is to locate all of their hiding places, Furniture, fittings and even crevices in wallpaper must be inspected carefully, even to the point of dismantling beds etc for easier insepction and possible treatment. An Incecticide will then be used to treat the problem. Usually dark reddish brown in colour, the adults are about 25mm long and the immature cockroaches (nymphs) resemble adults except that they are wingless. Biology:Unlike other pest cockroaches, Orientals cannot climb up smooth surfaces. 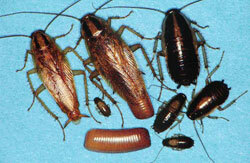 Oriental cockroaches generally live in moist areas, but can survive in dry areas if they have access to water. They tend to prefer cooler temperatures and thus are common in basements, boiler houses and walkways adjacent to buildings. The Oriental cockroach breeds well in unventilated crawl spaces or basements where humidity is high. Adult cockroaches can live up to one year, during which females produce an average of 150 young. Thiis cockroach prefers to feed on starchy foods but will adapt to survive. Control: Use of monitoring traps to physically catch and determine the extent and distribution of an infestation, along with insecticidal gels and well targeted use of residual insecticides where appropriate as recommended. Adult German cockroaches are about 17mm long and light brown except for the shield behind the head marked with two dark stripes, which run lengthwise on the body. The nymphs are wingless and nearly black with a single light stripe running down the middle of the back. Egg capsules are light tan. Control: An integrated approach involving the use of cockroach traps, incecticidal gels and well targeted use of residual insecticides where appropriate is recommended. Night time inspections may be necessary in difficult to control infestation situations. Biology:In temperate climates it is an indoor species, associated particularly with large facilities such as hospitals, prisons and blocks of flats. 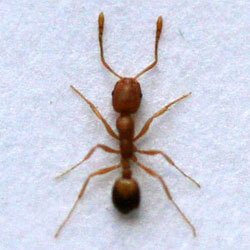 Unlike some other ant species the queen may be replaced by other queens. This is an important feature to bear in mind during control, as new queens can be produced when needed resulting in colonies which are able to split. Control: A thorough survey will be undertaken, usage of conventional residual treatments are generally not effective as they may cause the nest to fragment. Baiting may be effective if slow aciting. Good results have been found using a juvenile hormone based treatment. 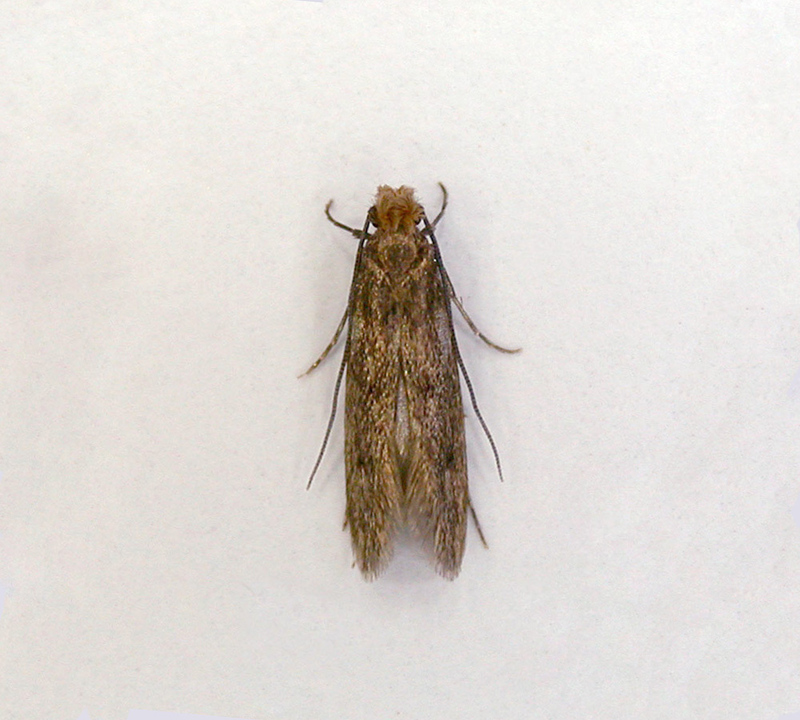 The Moths are approximately 5mm in length. Forewings are yellowish-brown, and there are usually three distint dark dots on the outer third of each wing. Hind wings are smaller, lighter and tinged with hair and scales. Eggs are whitish, and larvae are opaque-white with brown heads. 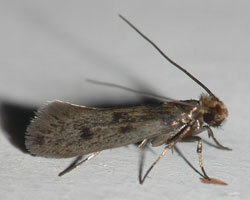 Biology:Clothes moths rarely fly to lights at night and instead prefer darkness, such as closet or storage chest. 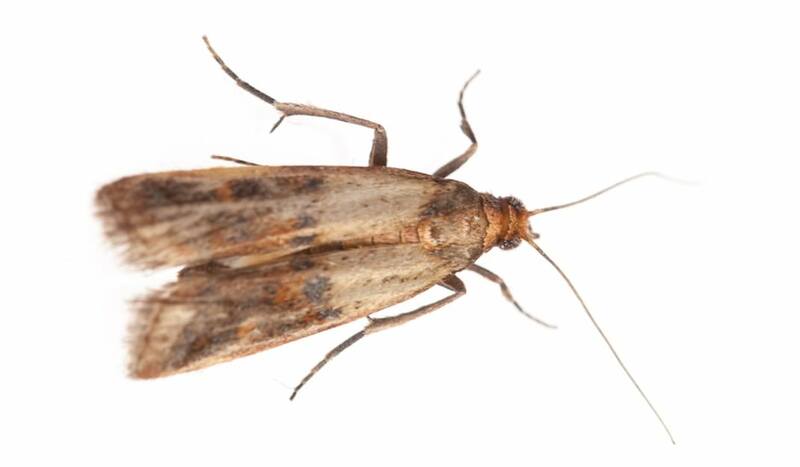 Any clothes moths fluttering around the house are probably males, because females tend to travel by running, hopping, or trying to hide in the folds of clothing. The female lays 100-150 white eggs on the surface of the fabric which will hatch into larvae in approximately 5 days. The persiod of larval development is usually 6 weeks, during which time the larvae actively feed on the fabric, however this can take considerably longer under cooler conditions. Slightly larger than the Case-bearing moth, adults can reach up to 7mm. The moths are a light shiny gold colour, with a tuft of reddish hairs on the head. Biology:Similar to the Case-bearing moth. Control:Controllng both of these pests requires careful examination of closets and stored goods for larvae cases, moths and damage to locate the source of the inffestation before treatment can be carried out. Adult moths are about 8 to 10mm lonf when at rest and have a wing spread of about 18 to 20mm. When viewed from above with the wings folded over the back, the outer 1/3 of the wind appears reddish-brown or bronze coloured "at the wing tips" while the inner 2/3 of the wing "at the basal portion" is light grey to ochre-yellow. Also the head and thorax are reddish-brown and the hind wings grey. Brown-headed larvae are dirty white, sometimes tinged pink or green. Biology:The female moth lays between 60 and 300 eggs, singly or in cluster, on or near the foodstuffs. Eggs hatch in 2 to 14 days with larvae or "tiny whitish caterpillars" dispersing within a few hours. Larvae move to foodstuffs, and feed in or near a tunnel like case of frass and silk which they web together. Under good conditions the entire life cycle required six to eight weeks and can be active all year around. However in cold climates, larvae over-winter and pupate in March. Control:Controllng this pest requires careful inspectioon of all stored cereal foods, discarding any heavily infested material. Floor dust and other debris in cracks and crevices need to be cleaned away or vacuumed. Following cleaning, treatment can be carried out using a residual insecticide, or ULV for large infestations or big areas. 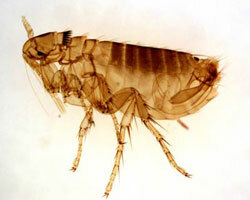 Adult fleas are 2-3mm in length and generally of a shiny brown appearance. They have a thin, laterally flattened body and large hind legs which allow them to jump onto passing hosts. Biology:Flea eggs are about 0.5mm long, oval, pearly-white in colour and laid indescriminently in the fur or feathers of the host or in its nest or bedding. Four to eight eggs are laid after each blood meal and a single female may produce 800-1000 eggs during her lifetime, which maye be as long as 2 years. The larvae thrive in dark, humid places such as animal bedding and carpet fluf, and feed on organic debris and adult flea excrement. Cats bedding may support a flea population of 8000 immature and 2000 adult forms. Control:Where very high populations of fleas are present, a single application of insecticide may not be sufficient, as even a 99% kill rate can still leave sufficient survivors to form the basis of a new infestation. In such cases additional treatments will need to be carried out until the infestation is eradicated. All floors and upholstered furniture should be vacuumed to remove animal hairs, organic debris, flea eggs and pupae. All floor areas whould be treated with a residual insecticide or a desiccant spray from skirting board to skirting board. 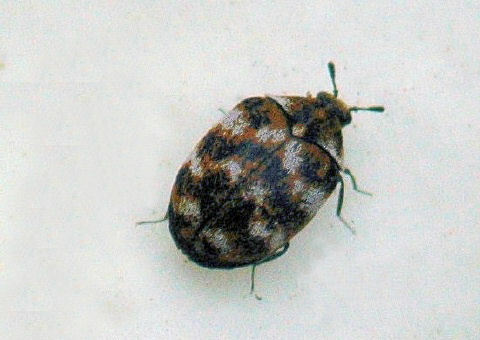 Adults are 2-4mm long and variable black or brown with mottled yellow or white markings. 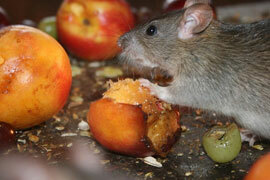 A pest primarily in the home, food and museum sectors (the latter causing a significant threat to collections). Biology:Mating occurs immediately after emergence. The female produces up to 100 eggs over a period of two weeks. Larval development lasts for 10-30 days. Larval forms (known as the "Wooly bear") can reach 4-5mm in size before pupation and can cause considerable damage to products such as wool, fur, leather, silk and animal skins, and occasionally cereal based food products. Adult carpet beetles usually live outdoors on pollen and nectar, and thrive in situations where they remain undisturbed, such as under carpets, bird and rodent nests and animal remains. Control:Before treatment can begin, the first step is to trace the source of the infestation such as old birds nests in lofts or rodent nests under floorboards. Where appropriate, treat and remove old nests with an insecticidal dust. Lift and treatment of the underside of carpets, around skirting boards, window frames, pipes from roofs spaces and disused fireplaces, and other ares likely to be contacted by invading adult insects with a residual insecticide. LPS offer a free site inspection to determine correct identification of pest, level of pest infestation and advice on prevention and control measures. All products used by are LPS are approved by CRD (The Chemical Regulations Directorate) of HSE (The Health & Safety Executive). We aim to offer solutions without risk to children, staff and non-target animals.